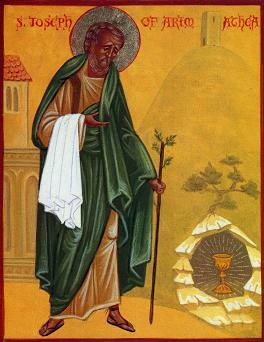 For those of you who follow the new calendar, happy feast day of Saint Joseph of Arimathea! Noble Joseph took Thine immaculate Body down from the tree, wrapped it in a clean shroud and spices, and having embalmed It, laid It in a new sepulchre. But on the third day Thou didst rise, O Lord, granting the world great mercy. Joseph of Arimathea took Thee the Life of all, down from the Tree as one dead, and wrapped Thee in clean linen and spices. He yearned to embrace and kiss Thy pure Body with heart and lips yet he restrained himself with fear. He cried to Thee rejoicing: Glory to Thy condescension, O Lover of mankind. On the Deconstruct website, I found a story about a young Serbian monk who provides pastoral assistance to scattered villages in the Serbian countryside. People from these villages bring him orphaned wild animals, and the monk has accepted this rather unusual ministry in addition to his regular duties. The connection between monks and wild animals goes back to the early centuries of Christian monasticism—and even earlier. Consider the prophet Elijah and his relations to animals. Biblical stories and Christian history are full of examples where the normal separation between man and beast is interrupted; therein, one sees an image of Adam in paradise, keeper of the kingdom. Even if you do not understand Serbian, you can more or less follow the news story about the monk. 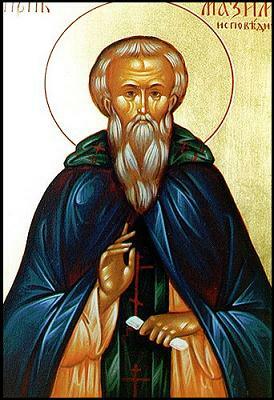 As a crowning over all the wonderful cases in the relations of the Saints with animals, it is perhaps worth mentioning the description from the “Thebaid of the North.” Someone visited Saint Paul of Obnaras who lived in a remote area of the Russian forests. When he saw him he became witness to the following: “A great number of birds surrounded the Saint. The smaller ones even climbed in his shoulders and head and he would feed them with his hands. Close to him was a bear that waited to be fed. Foxes, hares and other animals would mingle without any aggression between them. It was a wonderful picture of the first created innocent Adam in the garden of Eden. Solitude in a forest may not be paradise, but I can imagine therein a monk’s glimpse of the world unfallen. Are we not all called to see such? This past week, I found a site called Ship of Fools. It is sometimes irreverent and sometimes sacrilicious. I think that its authorship and readership must be full of postmodern Christians who cannot adhere to anything without a fair bit of irony. Of course, all human matters, including religion, provide ample opportunities for ironic observation. The most interesting part of the site for me is the “Mystery Worshipper” section. Evidently, readers visit religious services that are not of their own traditions, and then they write about their experiences. Being well acquainted with various Christian sects, I enjoy reading others’ perspectives and recognizing familiar elements in their accounts. So, if you can tolerate a certain level of Christian disrespect for sacred matters, you may find the site worth a visit. On this day dedicated (on the old calendar) to celebrating Rome’s most important saints, Peter and Paul, the more ecumenically minded often have kind words to say about the papists. Though I am not so ecumenically inclined, I freely admit that Rome’s top dogs are first class, Westminster grade specimens. The Wall Street Journal has a short article on the Padishah’s visit to the Vatican, “Pope Presses Obama on Contentious Points.” Therein, we read that Benedict evidently gave the president copies of Dignitas Personae and Caritas in Veritate. I wonder if our Marxist in Chief will read them. Who knows? At least, the bishop of Rome understands his role as magister well enough to extend some instruction to his visitor. I suspect that many Orthodox prelates would not be so bold . . . or frank. I suppose that an Easterner cannot out-frank a Frank! Bad, bad historical joke . . . Anyway, the next time that you have to listen to an ultramontane tirade, diplomatically acknowledge that the Roman Church, to its credit, has selected quite impressive leaders throughout its time. Of course, men like Honorius, John XXIII (the second, not the first, who was just a scheming politician like most from his age), and Paul VI will occasionally crop up, but overall, they are impressive folks. Even the wicked ones like Alexander VI were admirable secular rulers, though wretched religious examples. I think that such worthiness is due to the College of Cardinals. It is an aristocratic regime mixed with gerontocracy—not a bad recipe for choosing wise leadership. I wish that our president and Congressional members were selected by similar means. I am confident that the resulting rulers would be much more fit to legislate and to command. You may be interested in the online “Dynamic Horologion and Psalter.” It is very impressive, listing the services, psalms, troparia, and kontakia for every date and time, on both the old and new calendars.